With TamoGraph® Site Survey, you are not limited to indoor site surveys. You can easily conduct surveys of large WLANs (e.g., campus Wi-Fi networks) outdoors and, in fact, the data collection process might be greatly facilitated because of GPS. During a site survey, the user walks the site with a notebook or tablet PC that collects Wi-Fi data that is then used for visualizing various characteristics of your WLAN. When you are indoors, you must "tell" the survey software where you are by marking your location on the floor plan with mouse clicks. But when you are outdoors, why not use a GPS receiver that can do that for you? That's exactly what TamoGraph Site Survey does when you perform a GPS-assisted survey. If you have installed TamoGraph Site Survey and it is up and running (a compatible Wi-Fi adapter is required), all you need to add to take advantage of the GPS functionality is an NMEA-compliant GPS receiver. This includes virtually all Bluetooth or USB receivers (e.g., by GlobalSat) that you can purchase for approximately $50 from any computer store. Once you have turned on the receiver and paired it with your notebook, you are ready to go! Configure TamoGraph to use your GPS receiver. You simply need to specify the COM port that your GPS receiver uses. Create a project. If you don't have a site map, TamoGraph will help you import a street map from an online map service, such as OpenStreetMap, or from Microsoft MapPoint. Set reference points. Mark three locations on the site map and enter their coordinates. This is called "calibration" and is a step that is required in order to link your map coordinates with GPS coordinates. You are all set in less than 5 minutes! Now start a survey. As you walk or drive, TamoGraph will automatically mark your location on the map and record the Wi-Fi data. After the survey, the program will be able to display different WLAN characteristics that are based on the collected data: Wi-Fi coverage map, signal level, interference, and many other metrics that give you insight into your network health and performance. 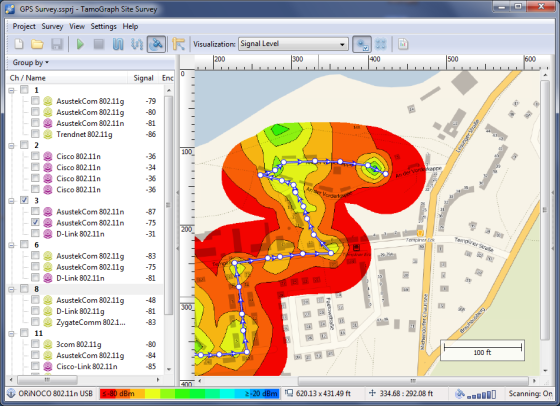 Download TamoGraph Site Survey now to perform a survey of your WLAN, either outdoors, with the help of GPS, or indoors, e.g., in an office, airport, or mall. See for yourself how this tool can help you reduce the time and costs that are involved in deploying and maintaining Wi-Fi networks and improve network performance and coverage. Note: GPS functionality is available if you selected the Pro evaluation mode during installation or if you purchased a Pro license.